In the age of living online, the greatest gift are the people you meet. The biggest drawback? The people you meet. Once a skeptic of online friendships, I’ve felt the connections made across the globe from one screen to another. A richness lent to my world through knowing people who live in such far off places, we never could have connected, seen our similarities, shared our thoughts and support, had it not been for two lap tops with internet connections. I’ve also seen the dark side of the vail that the computer brings, an entire society of online bullies waiting with snark and nastiness to prey on anyone with a voice. I know. Horrifying. People fail to realize that another human, possibly a stay at home Mom looking for a connection to the outside world, a widow, an introvert with crippling agoraphobia, or just and average joe, will read that and be incredibly hurt. We all remember the worst comment that was ever posted to our blogs, the sting from a complete stranger who’s hate has invaded our world. I’ve recently seen two celebrities melt down on Twitter, responding to the nasty comments, defending themselves, lashing out, retweeting insults, indulging those Trolls who seek to disperse hate. 1. Don’t Feed the Trolls. Don’t respond, engage or even post comments made out of sheer hate and anger. If a comment is just made to hurt, there is no reason to post it and you have no moral or civic obligation to do so. Delete the comment and shake the thought of it from your head. 2. Find Power In Silence. To stay silent and to be silenced are not the same thing. There is powder in silence, feel it. There is no response to a bully or a nasty comment that makes you look cool or superior, you are only wallowing in the mud by responding. 3. Feel Pity. Child Actor turned writer, Mara Wilson said on her blog recently: “Very few intelligent, successful, attractive, confident, happy people spend their time bashing people they have never met. Just be glad you are not that person.” A comment a stranger makes about you says a lot more about them then it will ever say about you. 4. Strangers Will Defend You. More often than not, when I see a nasty comment posted on a blog, I watch others rush to the aid of the blogger. People who don’t know that blogger or the commenter, but who do know right from wrong, and are quick to rush to your defense. 5. Feel Important. No one throws rocks at Tiny Tim. If you are a blogger or a celebrity, the negative comments you receive will rise in direct proportion to how important people think you are. If they didn’t think of you as successful, they wouldn’t even bother. Negative comments are a direct result of doing something right, try to think of it that way. I try to follow these rules on both this blog, as well as my other blog, The Beeroness, which has garnered a much higher level of praise as well as exponentially higher level of nastiness. With the good comes the bad, finding your own inner filter will help you enjoy more of the experience. In a completely unrelated note, these Jalapeno Corn Waffles are perfect for brunch, or to serve with Fried Chicken. And you’ll want to drink the Sriracha Maple syrup on it’s own. Beautiful waffles, and beautiful thoughts on bullying. It’s true, it happens, and far too often. I’m astonished at the words that people choose to use, simply because of that anonymity that the internet allows. You gave some great tips! These waffles sound absolutely delicious. May need to make them when I get home. Cool idea for sriracha maple syrup! I haven’t gotten any meanie moments on my blog yet though I did see a catty comment about one of my recipes on a group forum. Whatever. I believe that being mean, in the cyber-sphere or in person, springs from insecurity and likely pain. You give good advice here. I’ve got your back if anyone tries to be a jerk to you! I’ll totally get all sorts of when-you’re-a-jet west side story on them. I’ve got jazz hands and I’m not afraid to use ’em! I just LOL’d at your Jazz hands. these waffles sound fantastic. as a lover of all things spicy, i’m sure i’d loooove them. awesome comments on negative blog comments/bullying, too. it’s a hard thing to witness + experience for sure, but i love your rules. Thanks! I always find it so much harder not to jump in and defend someone else than it is to resist the urge to defend myself. People can be so mean. I think you starved them to death! They always find it more fun when people “play” their games and get bored easily if they see you aren’t the type. Good for you. These look awesome! A recipe for all of my boyfriend’s favorite things (jalapenos, sriracha, cheese) mixed into one thing he doesn’t like (waffles). I think I may be able to swing his opinion with this! Um, so why did I not make the connection that you also blog at The Beeroness? I’m a wee bit slow sometimes. I love these tips–I think the best is to just delete the comment! Nothing bugs these people more than that. One of my blogging friends was targeted by a popular website last week and not only did people mock her on there, but they went to her blog to leave nasty comments too. I just don’t get who has the time for that. And what kind of person gets anything out of it? Also, there are so many more nasty online snark sites set up to mock other bloggers, it’s really sad that someone would spend so much time, money and talent just on hate. Oh, and very few people made the connection that I was also at The Beeroness, don’t feel slow! Those are definitely some good tips to follow by. While I don’t often get nasty comments on my blog (bakeblogging.blogspot.com), I do get them on my video blogs on my youtube channel (even though my vlogs are posted on my blog as well). People are definitely cruel when they can hide behind an anonymous screen name, but I do agree that the most important thing is to ignore them. I don’t delete their comments because I believe everyone has a right to their own opinion whether I agree with them or not. Plus, I rather the world see and judge for themselves how negative their comments are. I see people feeling much more bold on other sites than on personal blogs. It seems to go up ten fold on online forums, youtube, twitter, or even when one blogger posts another bloggers recipe. If they aren’t at your “house” they feel free to be much nastier. I post helpful but negative comments on my blog (i.e. “I really didn’t like this recipe, it turned out kind of mushy and salty”) as long as they aren’t aim to hurt, like one I recently got on the Beeronees that in summation said, “You are disgusting whore and that is why you are still single!” *Delete* Besides the fact that I haven’t been single since the 90’s I’m pretty much as far from a “whore” as you can get! There was no way I was posting that, besides, I like the idea that who ever wrote that would keep coming back to my blog just to check if it got posted or not! That life online I guess, but that whole “sticks and stones” thing is much harder in practice than in theory. Love this post Jackie and Waffles with Jalapeño, delish! You have a lot of useful pointers about bullies. This is a well composed article that I have bookmarked for future reading. Have a fun. Great tips girl! You are so right. Don’t engage is the most important one I think…people try to defend themselves (understandably) but it just makes the trolls want to say more. The trolls are really terrible. I haven’t gotten any troll comments on BFB yet…they may come eventually. All that aside, I love the spicy maple syrup with fried chicken and waffles…genius!!! These look and sound completely delicious! Beautiful photos. I really appreciated what you had to say about online bullies as well. Sometimes it can be hard to shake the negative comments! These are really thoughtful tips – I haven’t gotten any mean comments on my blog yet, although I’m sure the day is coming. Although on my FB page, someone felt the need to tell me they hate baked cheesecake, after I had posted a recipe for cheesecake. I thought, okay, good for you, so don’t make this then! What a great post. I will be sharing this with my students! As a teacher (computer technology = internet safety and cyber bullying and all sorts of other good stuff) my students always hear me talk about my blog so I cannot wait to share with them the advice of another great Blogger (and this way the “just ignore it” advice isn’t just coming from the teacher as well). Keep up the good work & I’m looking forward to getting a waffle maker from my wedding in the future so I can make these yummy looking treats!! I’m so glad you are teaching students how to deal with bullies! I remember hearing from my teachers to just ignore it and walk away, and it really doesn’t get much easier when you’re an adult. You think it goes away as you get older but it really doesn’t. Learning this stuff when you are younger will help so much as you get older to deal with it in a healthy way. Let us spend more time, interacting, sharing thoughts, experiences and wonderful recipes like this. =) Hugs! The WORST are the people who build entire websites to hate another person. There are several targeting The Pioneer Woman. It so sad to me that someone will dedicate their life to hate another person. DIsgusting and pathetic. Omg I can’t believe people actually say that crap. I have chills just reading them over. People are so ridiculous. Ugh. On a more pleasant note, these waffles are amazing! 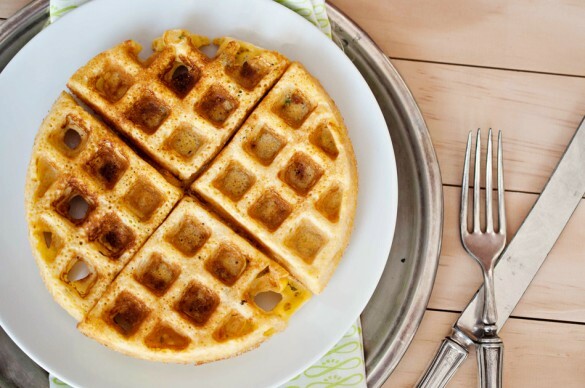 Okay now I really need to invest in a waffle maker because there’s no way I’m not making these. I’ve been fortunate to not have to have dealt with trolls thus far in blogging – but when I see it happen to others I love and who’s work and cooking (or life blogging) is a labor of love and place of joy, it breaks my heart. Thanks for speaking out on this one Jackie. And on another note – I’m so totally making these for the fiancee when he comes home. He’s a sriracha fanatic. Hey there Jackie!!! What a fantastic post! I can’t believe people waste their time on negativity. You’re so right when you say that a negative comment says more about them than you. Personally I wish I had that kind of free time!!! (though I’d spend it waaaaay differently, no doubt!) 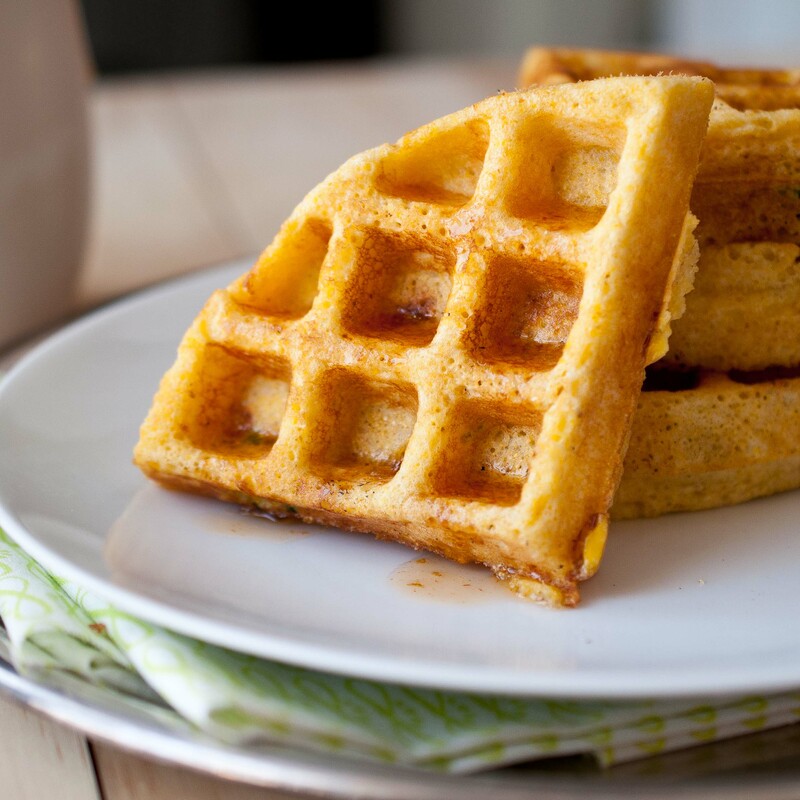 These waffles look fantastic, and congratulations on the Tasty Kitchen front page feature! 😀 That’s fantastic!! Hey! So I LOVE the idea of your waffles. Did you use a standard waffle iron or a Belgain waffle iron? The pictures make them look taller like a Belgian one. Thanks and can’t wait to try them! Yep, its a Belgain. But it should work just as well in a standard waffle iron. Great advice! It’s funny – We can receive 99 positive comments and 1 negative one, but the tendency is to dwell on the negative one. So true. I hate that, I wish I could just focus on the positive ones. Just found this site by accident – looking for the recipe for your waffles… So… just want to say.. I have banned hate-speech from my facebook page. I do not want to read unpleasant speech about gays, older people, different races… heavy people, republicans, democrats… I just posted that if any of the people I have as friends post hateful remarks – or ad hominem attacks – I will de-friend them – because they became my friends my accident… I want to hear and read up-lifting messages for everyday. Thanks for the waffle recipe. You can friend me if you like … on facebook. Oh yeah! It’s finally here. It rlelay is a great waffle and even good reheated. My Saturday and Sunday brunch menu this week-end has now been decided. Thanks, Gabi!!!!!!!!!!!!!!!!!! Thanks for this post- sometimes I will read yahoo comments after an article until my husband reminds me they are the cesspool of the interwebs- so true! I know! Anyone that has met her could never hate her, she is one of the sweetest and most genuine people I’ve ever met. But that is life online! People can hide behind the screen and spread hate without consequence. I just have to remind myself that to feel sorry for anyone who would act like that. When you posted the part about the bullying, oddly enough I thought of Ree Drummond and the “alternate” site that someone created pretending to be her. Scary what happens when you Google people. I’m still sickened by some of it. And the trolls that post book reviews of her books on Amazon in ways that, if they were out in the open, would be open for character defamation suits. I hate to say that I fed the troll on Amazon. I gave them their shocked and angry reaction for the day. As a teacher, I see the “known” anonymity that Facebook and the like gives bullies. They think, even though they know the person, that they are more protected when they bully by using an interface such as Facebook or Instagram. Made this for breakfast this morning and it was fantastic. Definitely a keeper. First recipe of yours I have tried…will be back for more. Thanks again! Awesome! Thank you so much Jennifer! This is bonkers creative. I mean . . . sriracha? In WAFFLES? So glad I tried it, though. They were really, really delicious. By the way, I substituted 1 percent for the whole milk because it was what I had on hand and they were still quite fluffy. These waffles are terrible. I substituted wallpaper paste for waffle mix, broccoli for jalapeños, and canola oil for sri racha— they were disgusting, and frankly madame, you should be banned from the Internet! !